The wood-engraving or woodcut shows two upper-class ladies, each in long dresses with matching head-gear. 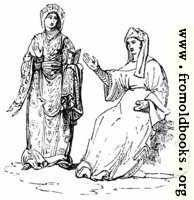 One lady stands and holds an open book while the other is seated and waves a hand. These are Anglo-Saxon Women from Old England.